WOW — who knew that you all loved flan so much?! 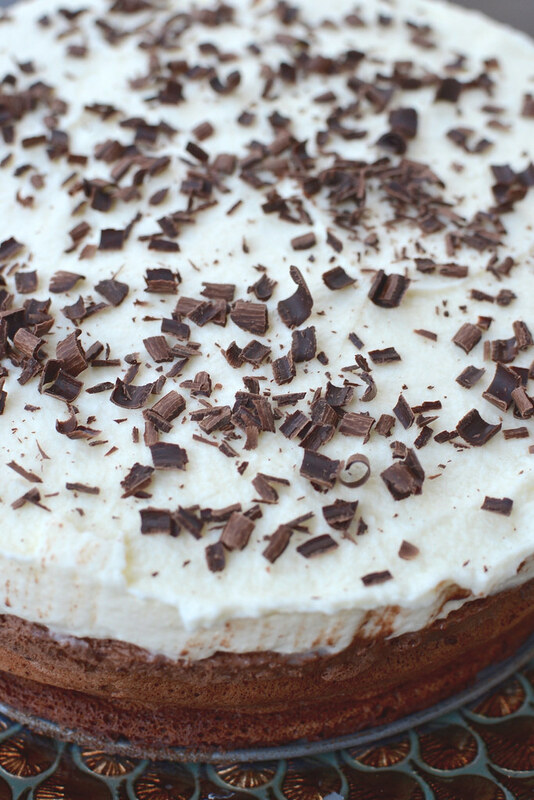 After I posted the Fam Din about V’s birthday flan, I got flooded with requests for the recipe! 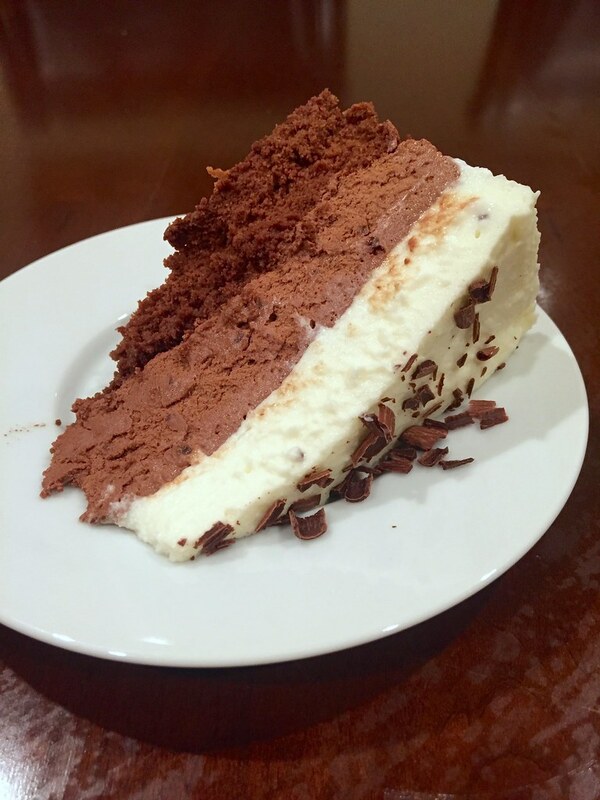 I don’t blame you, it really was quite lusciously delicious. I consulted with Big Seestrah, since the original recipe was her F.I.L.’s and she obliged saying that she had tweaked it enough to make it her own. Now a quick forewarning for all of you Vietnamese Flan (“kem flan” or “bánh flan”) aficionados. This recipe does not contain any condensed milk or coconut milk like many traditional Vietnamese versions do. And quite frankly, I think that’s one of the reasons why I like it so much since it’s not too sweet. Plus I have a theory that the consistency of both coconut milk and condensed milk make for a heavier flan that’s more likely to cause large bubbles. I have no scientific backing on that theory…just a hunch. 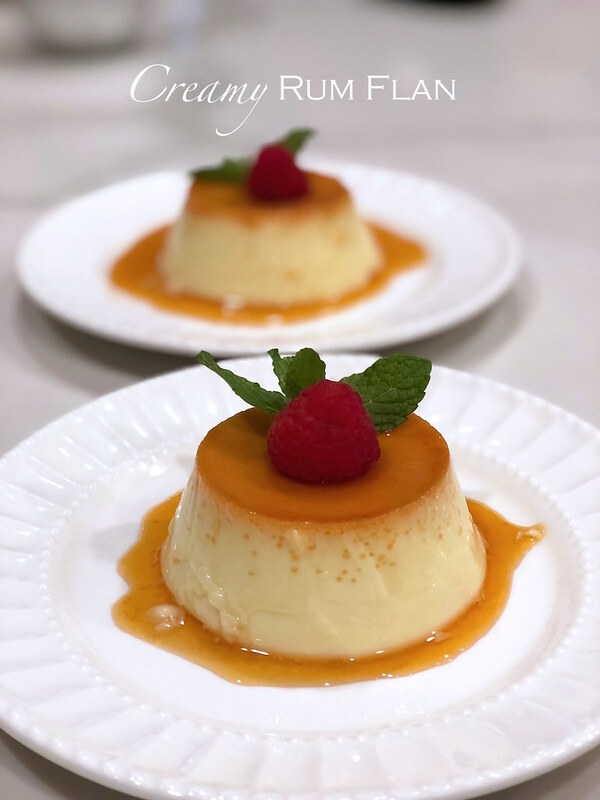 You can choose to make larger dishes of flan or individual sized ones like seester did above. 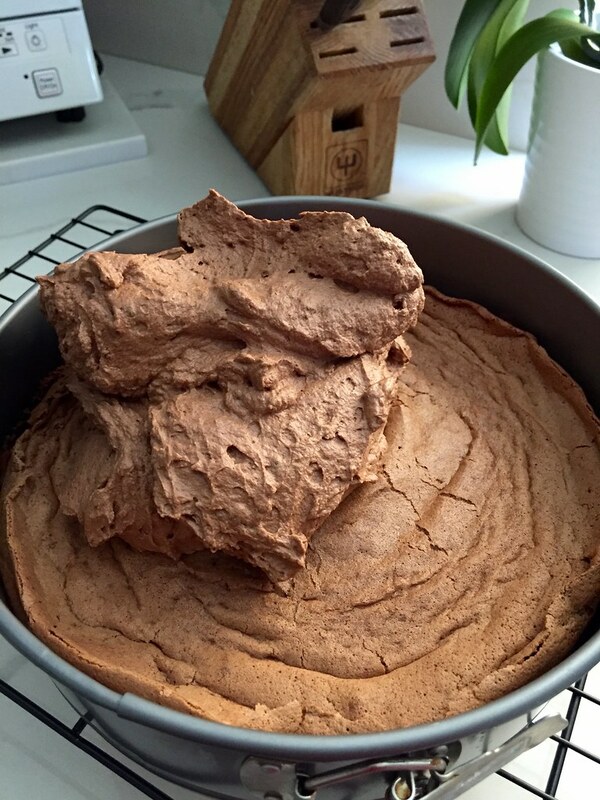 Just be sure to adjust for baking time depending on the vessel. But either way, super delish. Oh! And if you’re not a rum fan, you can sub with any booziness you’d like — or just skip it! But as for me, I say HECK YES to rum as it pairs so well with the caramel. Thanks for sharing Seester N!!! Place 10 ramekins (4-6 ounces) or 2 baking dishes in 2 roasting pans. You’ll need the roasting pans to create a water bath later. In a small, heavy bottomed pot, add in 1½ cups sugar. Over medium heat, cook the sugar until it caramelizes and becomes golden brown. Be sure to stir often. 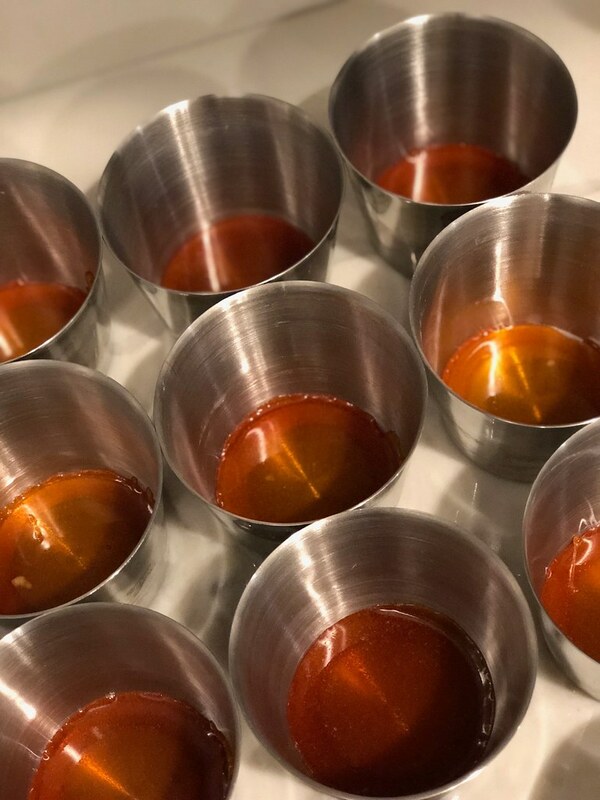 Once the sugar has reached the desired color, quickly pour the caramel into the bottoms of each ramekin/dish. Swirl each so that it completely covers the bottom of each vessel. Set aside and allow the caramel to cool. In another pot, whisk the milk and remaining sugar over medium heat. Continue whisking until the sugar has dissolved and the liquids come to a soft boil. Remove the pot from the heat and allow to cool. In a separate bowl, whisk the eggs and rum together until combined. Slowly whisk the milk mixture into the eggs. Pour the custard into the prepared ramekins/dish and cover with aluminum foil. Place the roasting pans in the middle rack of a preheated 380 degrees F oven. Carefully fill the roasting pans with boiling water to come halfway up the sides of each ramekin/dish. Bake the flan for approximately 45-60 minutes or until the center has just barely set. The length of cook time will depend on the sizes of your ramekins/baking dishes. Once done, remove the flan from the water bath and allow to cool on racks until they reach room temperature. Cover each the flan with plastic wrap and refrigerate overnight. Once you’re ready to serve, carefully run a hot pairing knife around the edge of the flan. Place a rimmed plate or serving platter on top and quickly invert. 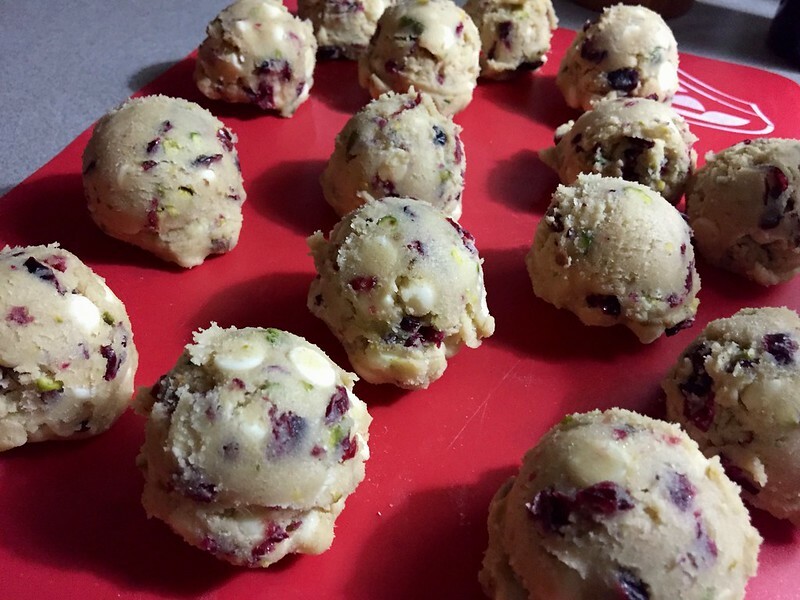 Serve with fresh berries, whipped cream, etc. *You can add less or more rum to taste. However, if you choose to omit you can substitute with 1 tablespoon of pure vanilla extract. 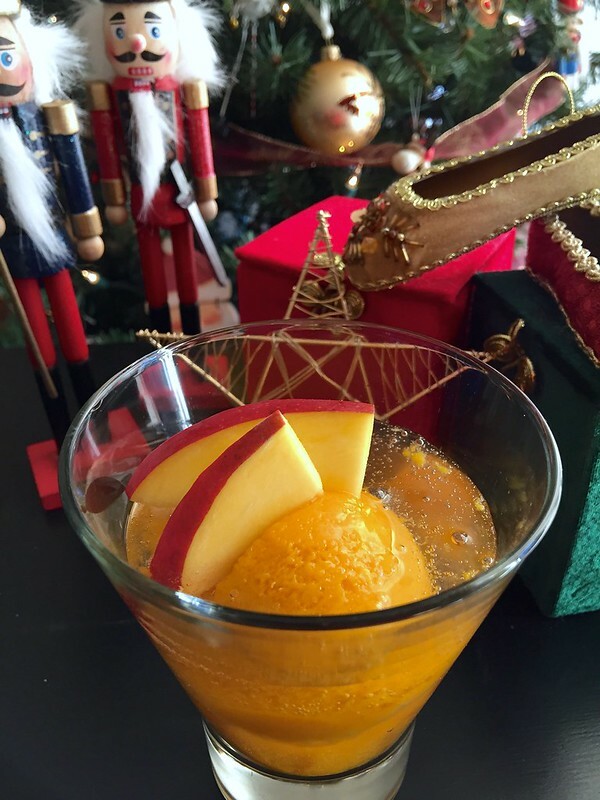 Mango Sorbet & Prosecco Cocktails – Happy New Year!!! I don’t know about you all but 2017 was a freaking doozy and I cannot wait to hit that reset button at midnight for 2018 to come on in! But before the clock strikes midnight, let me share one last thing with you all. 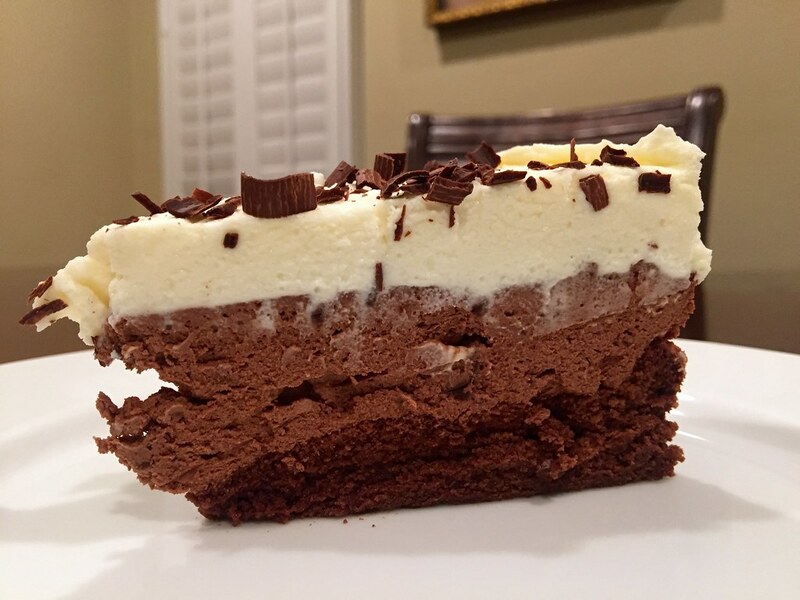 A super quick, super easy but delicious “dessertail“. It’s a mix between a dessert and a cocktail of course! Mango Sorbet & Prosescco Cocktails. These beauties are so simple that it’s kind of silly that I’m writing it as a recipe. 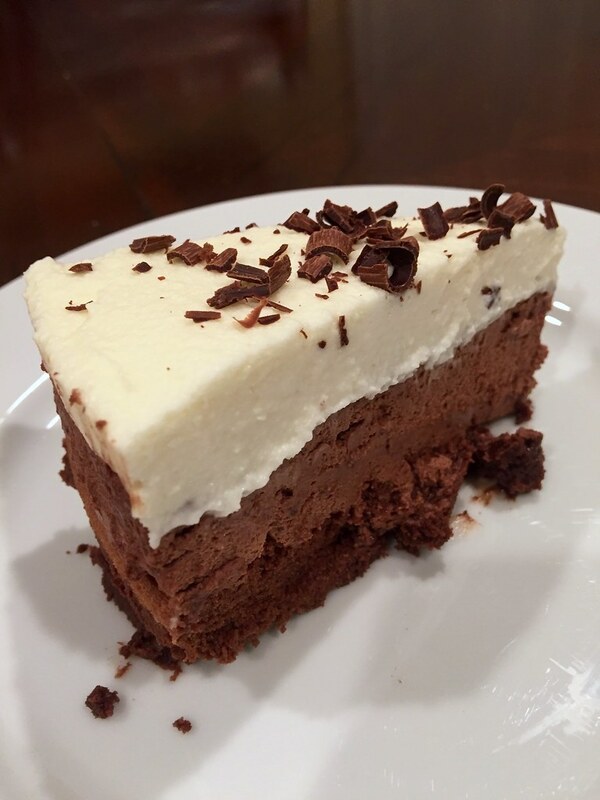 But let me tell you, it’s the PERFECT thing to serve when you don’t have time to make anything elaborate but still want something a little special. 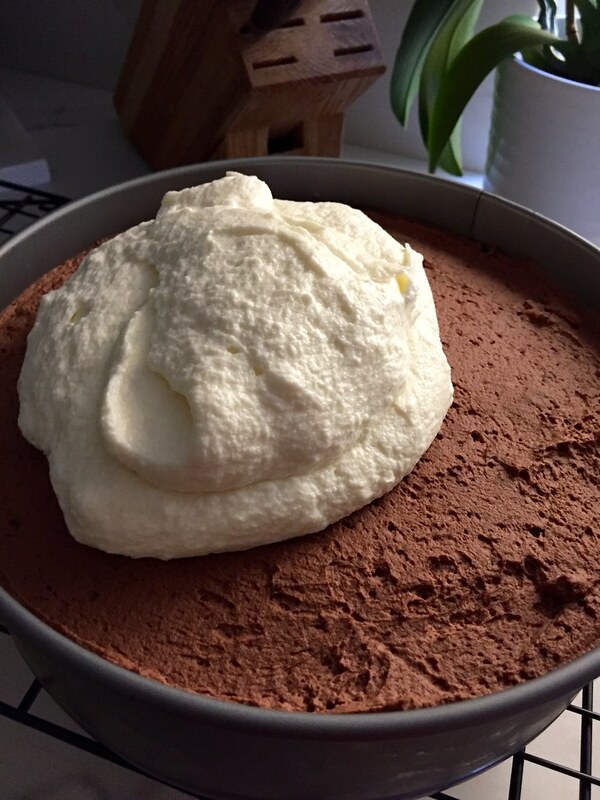 It’s an easier take on the Itallian sgroppino that slowly blends softened sorbetto and prosecco together. But I find that pouring the prosecco over the sorbet is just as delicious. Heck, I don’t even make my own sorbet and prefer to pick up a pint of one of my faves – Talenti’s Alphonso Mango Sorbetto. And of course, if you’re not a fan of mangoes, any other flavor sorbet would be just as delicious–or even a combination of them. Raspberry and lemon? Passionfruit and coconut? Options are endless! With that, let me wish you all a very, very Happy New Year. May 2018 bring you all overwhelming joy, fulfillment and of course, delicious Foodventures! Place two rounded scoops of sorbet in a chilled glass. 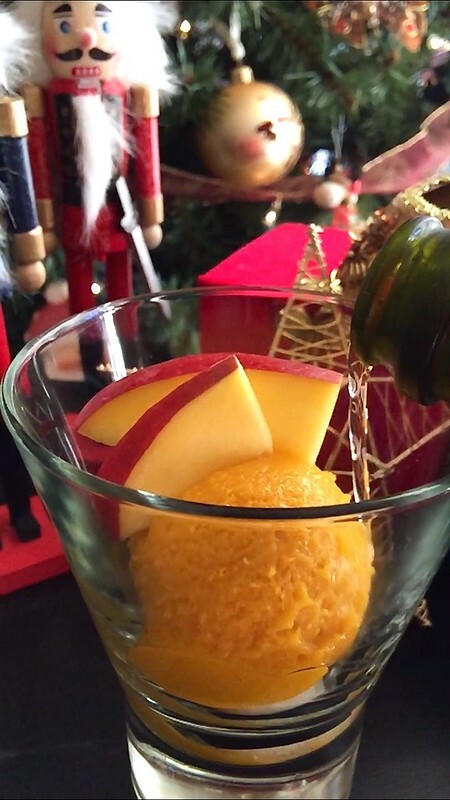 Add a few slices of mango and slowly pour prosecco over the sorbet. Cheers! It’s been an incredibly busy holiday season so far and things definitely won’t slow down until after the new year. 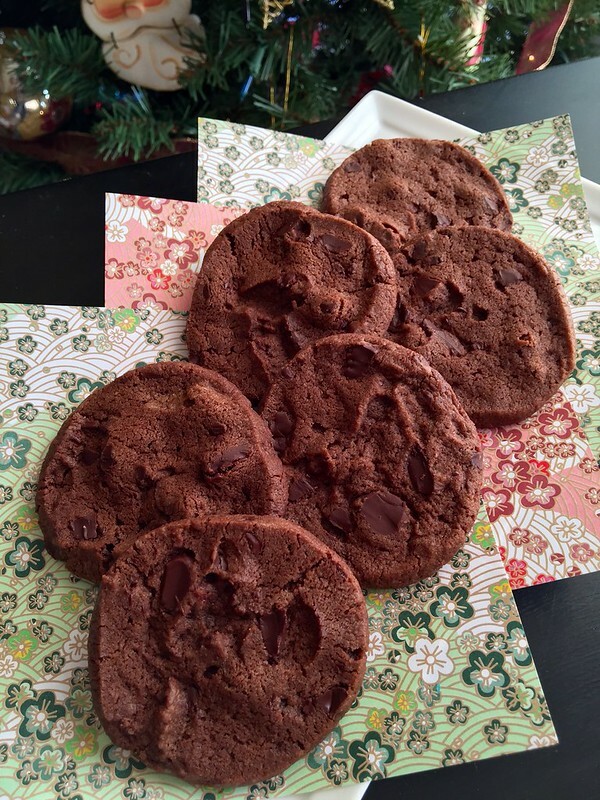 But I couldn’t let Christmas pass without sharing this old favorite….Dorie Greenspan’s World Peace Cookies. Seester P first made these for me years ago and I was immediately in love. They’re a sablé cookie, a French shortbread. 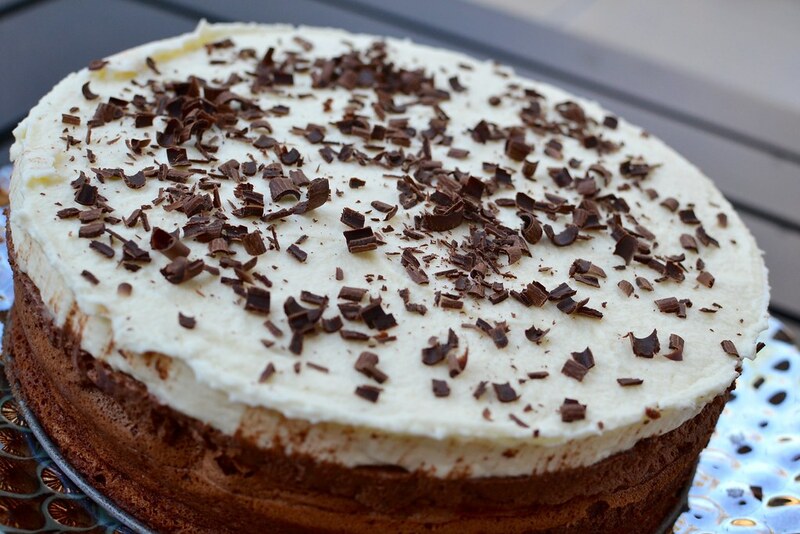 Buttery, chocolatey and just so darn good! These beauties come together relatively easy so they’ll be fantastic to leave out for the big guy. And trust me, if you do, you’ll definitely be on his rockstar list. 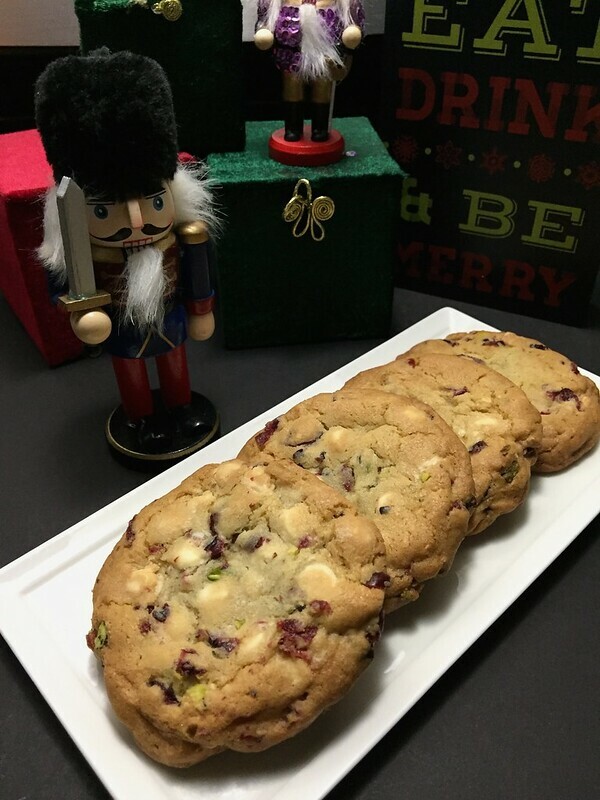 It’s no secret folks…I love cookies. 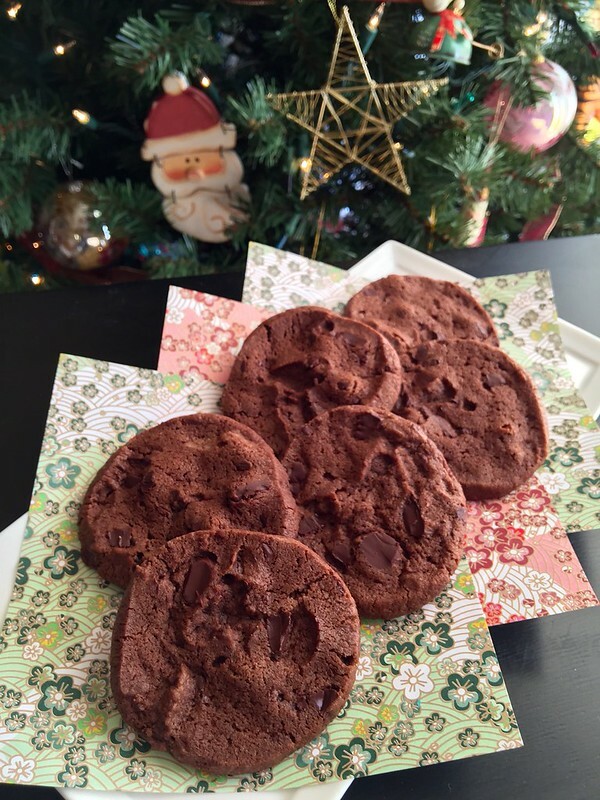 And it’s during this time of year that I like to try out a few new recipes to add to my Holiday Cookie Platters. 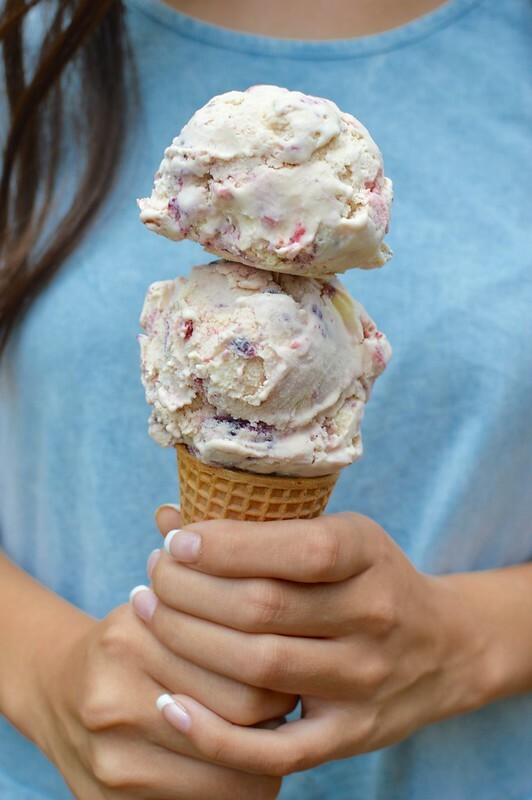 And sometimes I’ll throw in a Mint Chocolate Chip Brownie or a Peppermint Kissed Brownie to stir things up. 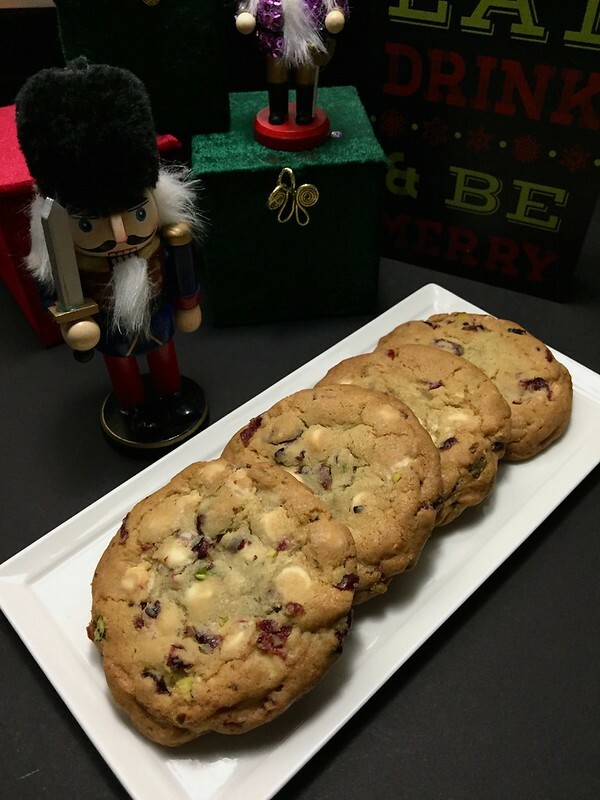 For this year, I wanted to use dried cranberries and pistachios together to create a festive sweet treat. 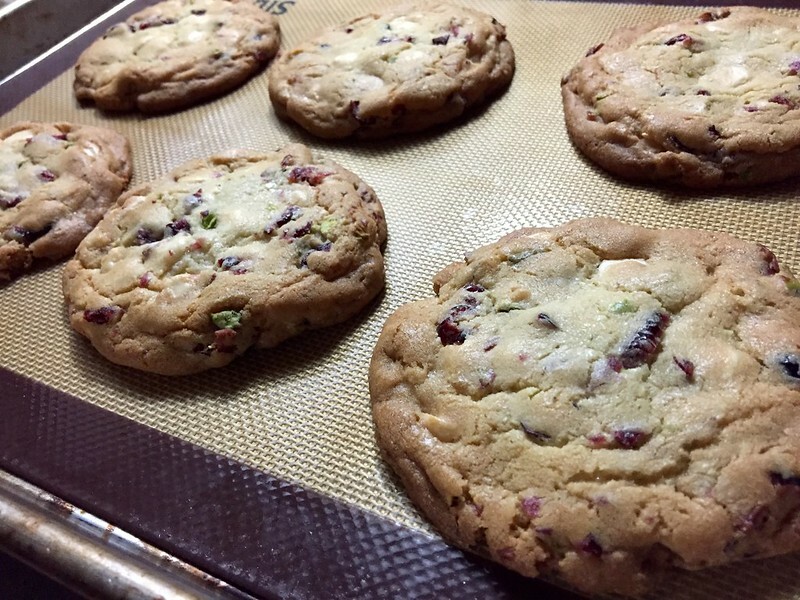 And why not add white chocolate chips to the party? It’s all kind of healthy-ish….right? Like trail mix? Ok….that may be a stretch. 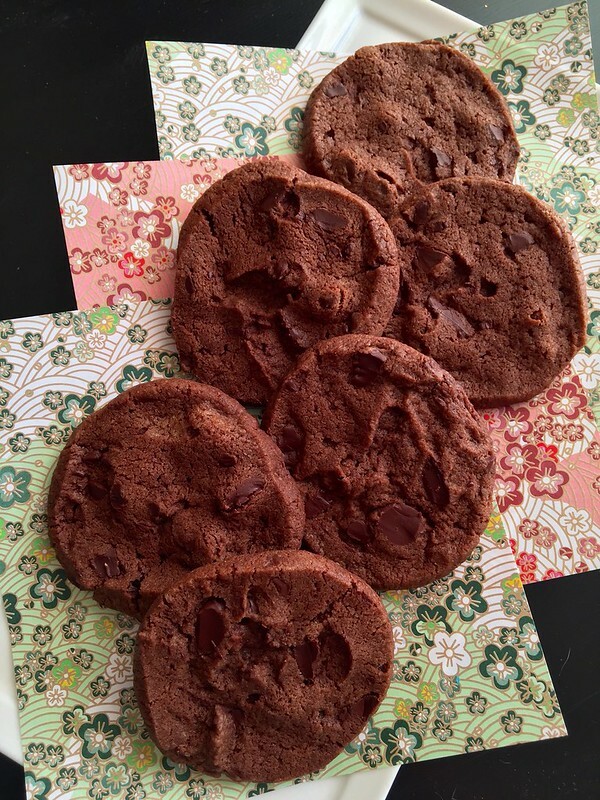 I opted to adapt the NY Times Best Chocolate Chip Cookie recipe from Jacque Torres because I love the textures of the cookie once baked—crisp on the outside and chewy on the interior. In lieu of the vanilla extract, I used orange extract and fresh orange zest to pair with the flavors. Folks were a fan of them! 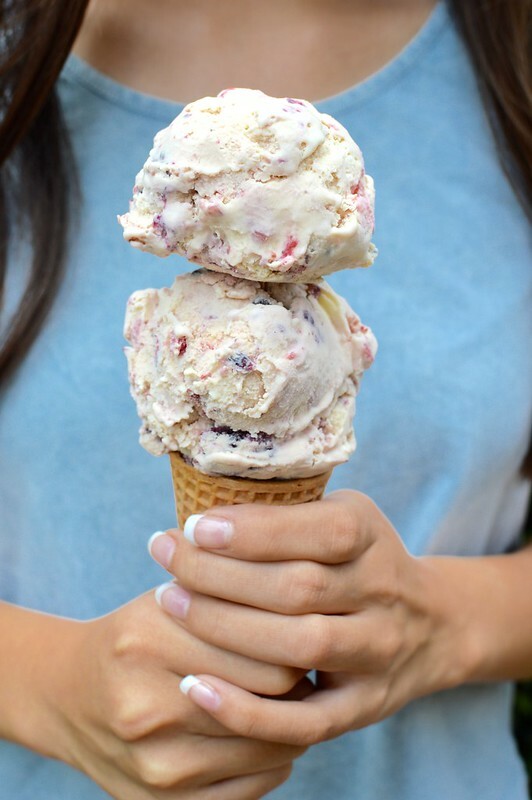 They’re super chunky and filled with lots of different textures from the nuts, chocolate and berries. Definitely filled with Holiday goodness. ps. We’re three days away from Christmas even and I still haven’t finished shopping! EEK! 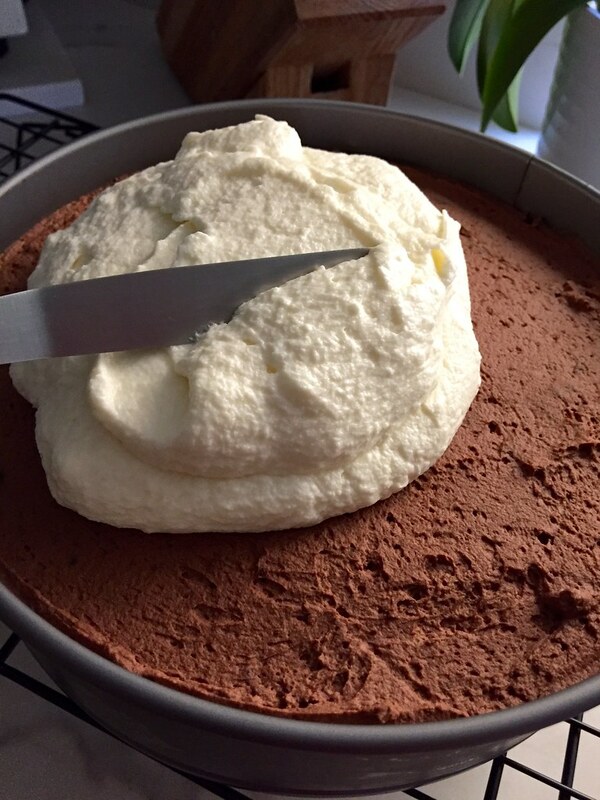 Using a mixer fitted with paddle attachment, cream butter and sugars together until very light, about 5 minutes. Add eggs, one at a time, mixing well after each addition. Stir in the orange extract and zest. Reduce speed to low, add dry ingredients and mix until just combined, 5 to 10 seconds. 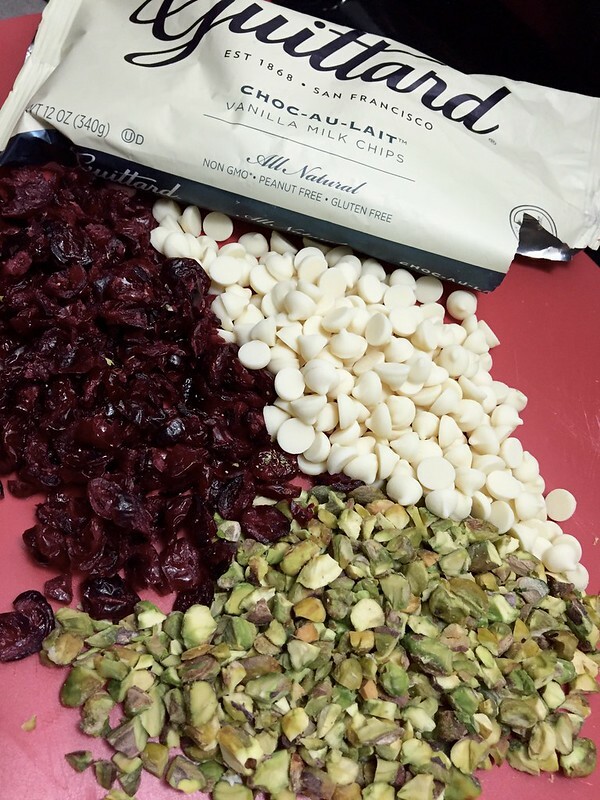 Add the white chocolate chips, dried cranberries and pistachios—mix until just combined. Press plastic wrap against dough and refrigerate for overnight. 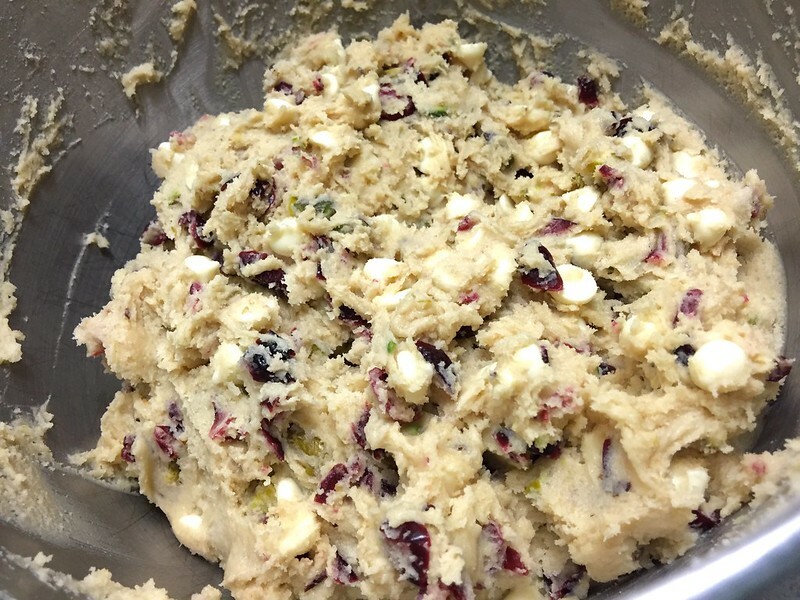 Scoop mounds of dough the size of large golf balls onto baking sheet and slightly flatten the dough balls. Bake until golden brown but still soft, 18 to 20 minutes. Transfer sheet to a wire rack for 10 minutes, then slip cookies onto another rack to cool a bit more. Repeat with remaining dough and enjoy! You’d think we’d be sick of it all by now—but of course, we can’t seem to get enough of it! There are even some health benefits to matcha — high in antioxidants, can assist with your concentration and help to detox. And if you use it in baked goods like I do, it finishes into a beautiful green hue –perfectly festive for the holidays. 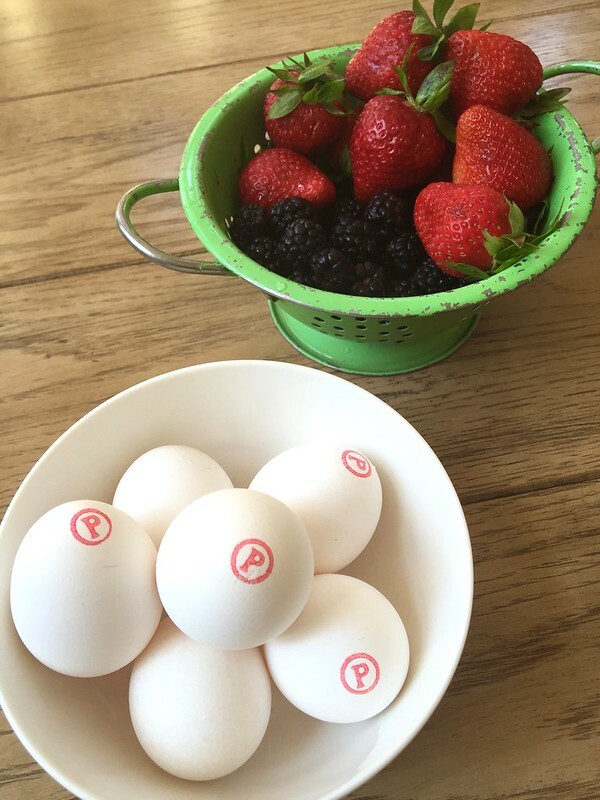 To close out my year as a Davidson’s Dozen, I thought I would take one of our favorite ingredients and combine it with their Safest Choice® pasteurized eggs. 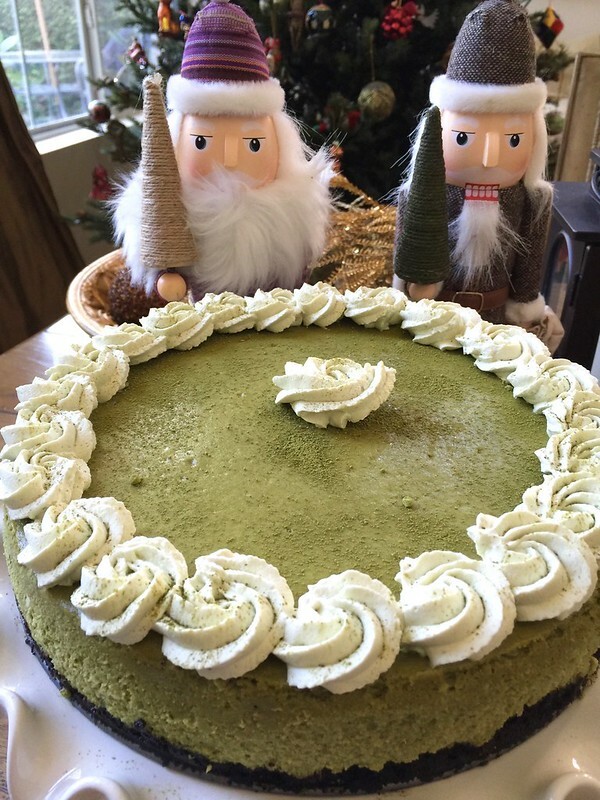 The end resulted in a rich and decadent Matcha Green Tea Cheesecake. 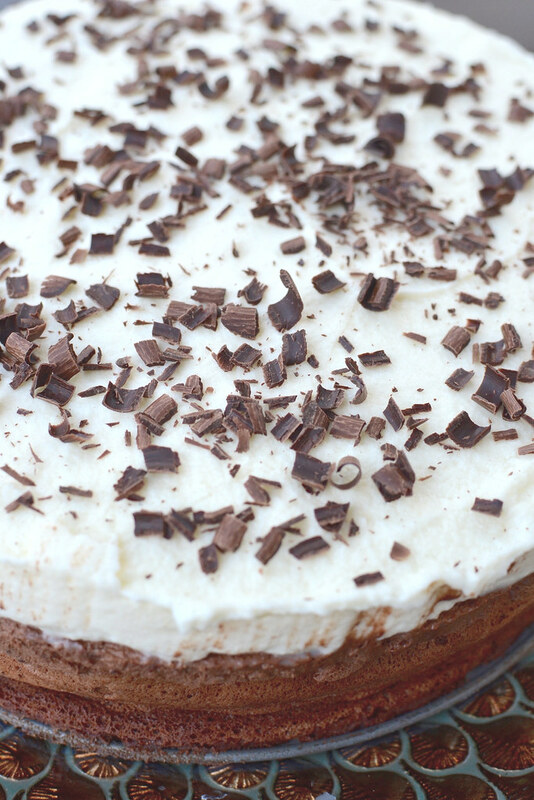 There are several different forms cheesecakes. 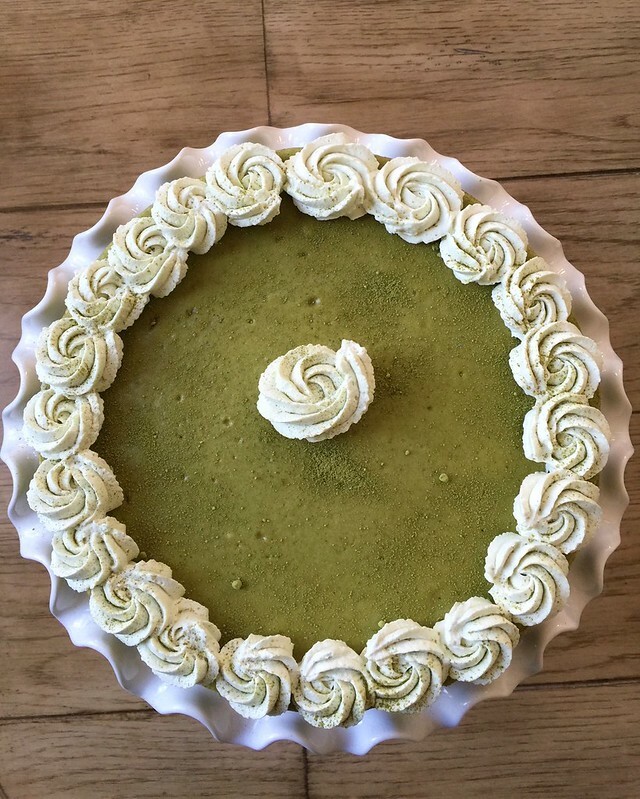 Some are baked and some are unbaked like my Matcha Green Tea Icebox Cheesecake. There are fruit flavored, chocolate based and some are light and airy whereas others are rich and dense. 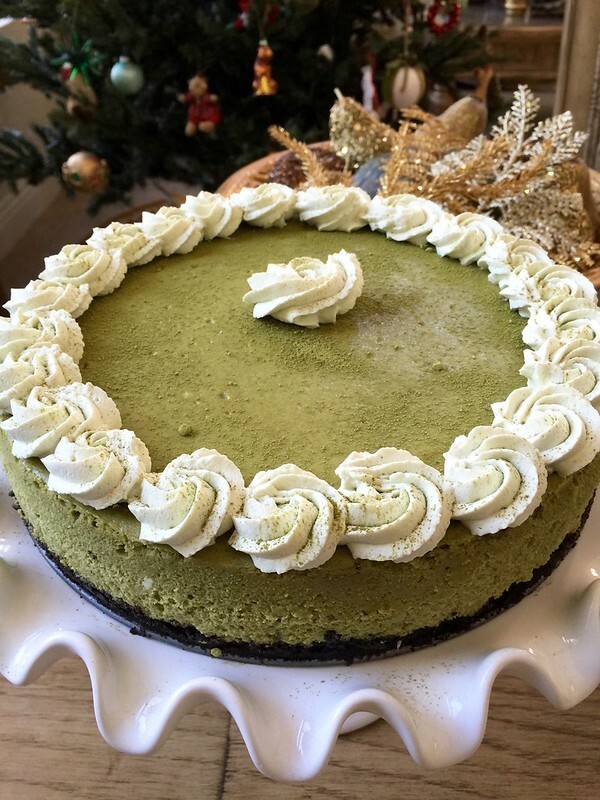 I generally prefer a denser texture –more along the lines of a New York style cheesecake –which is how this baked Matcha Green Tea Cheesecake was inspired by. 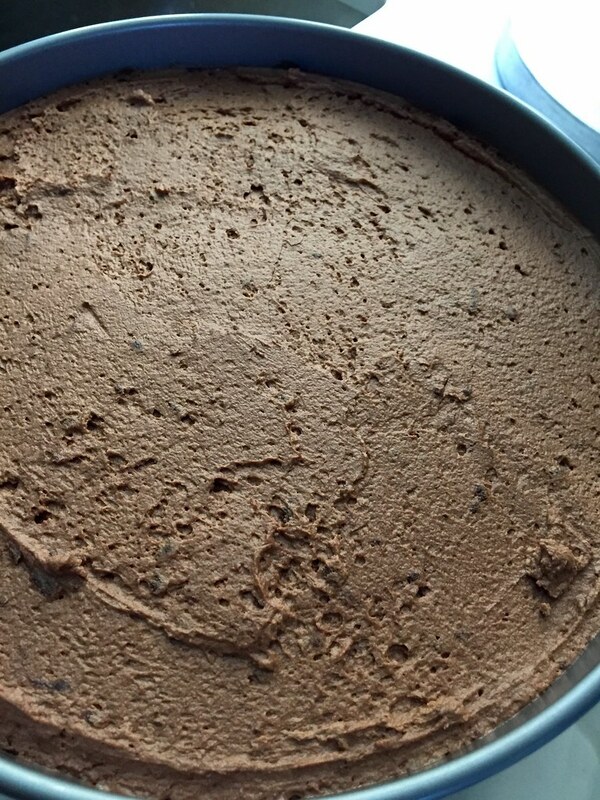 The crust of the cheesecake started off with chocolate sandwich cookies that I threw into the food processor — cream filling and all. Once the cookies were pulsed into the texture of sand, it’s then mixed with some melted butter and baked off in a springform pan for a few minutes to set. The filling is a combination of cream cheese, sour cream (for that added bit of tang), sugar, Safest Choice® Eggs, and a hefty dose of ground matcha green tea. Davidson’s Safest Choice® Pasteurized Eggs are all-natural, hormone and antibiotic free which all leads towards a delicious farm-fresh flavor. 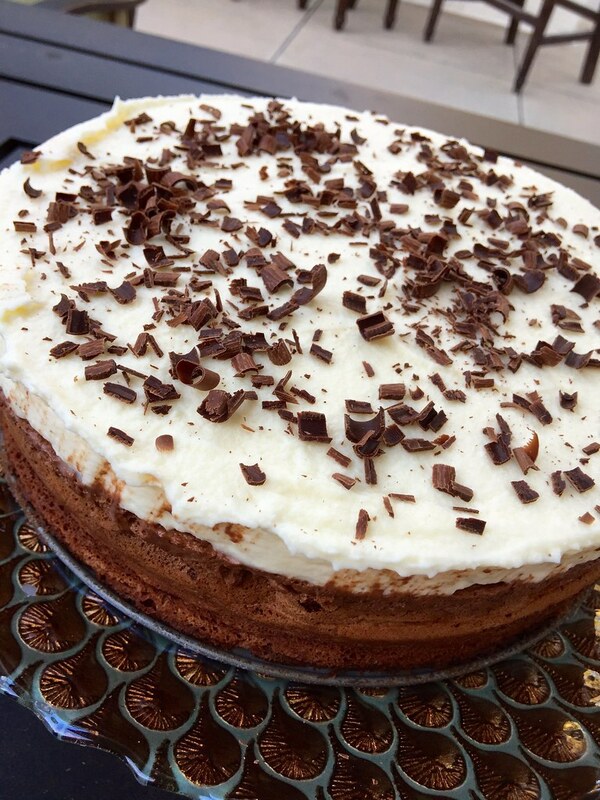 They give the cheesecake a smooth and creamy consistency that your loved ones will adore for the holidays. 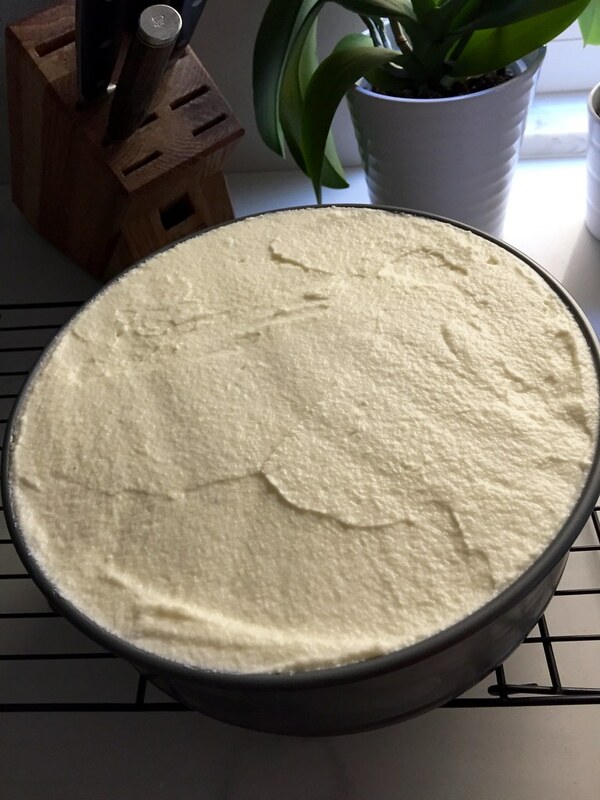 The cheesecake is then baked in a water bath to provide moisture in the oven so that the top doesn’t crack. 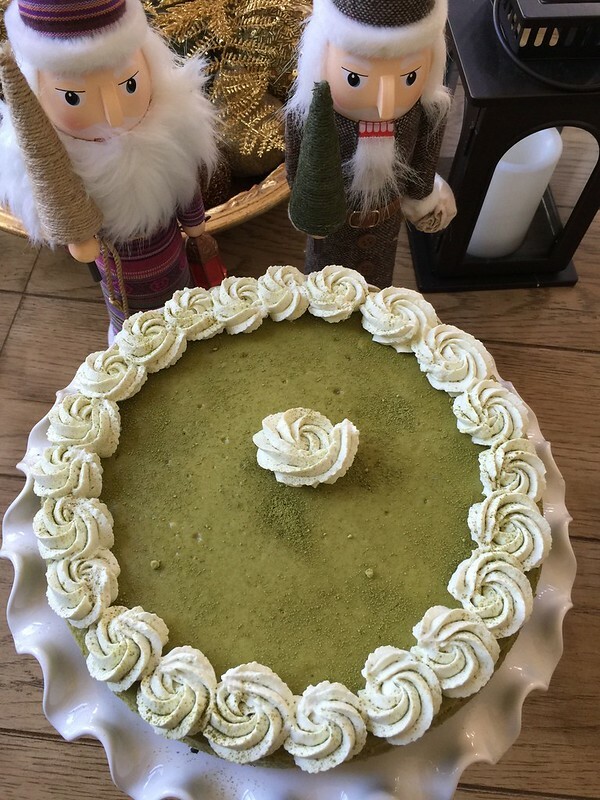 After chilling in the fridge overnight, it’s then topped with matcha flavored whipped cream. And I’ve got to admit–it tastes fantastic! Chocolate pairs especially well with matcha — the green tea is slightly bitter and balances the sweetness from the cake. 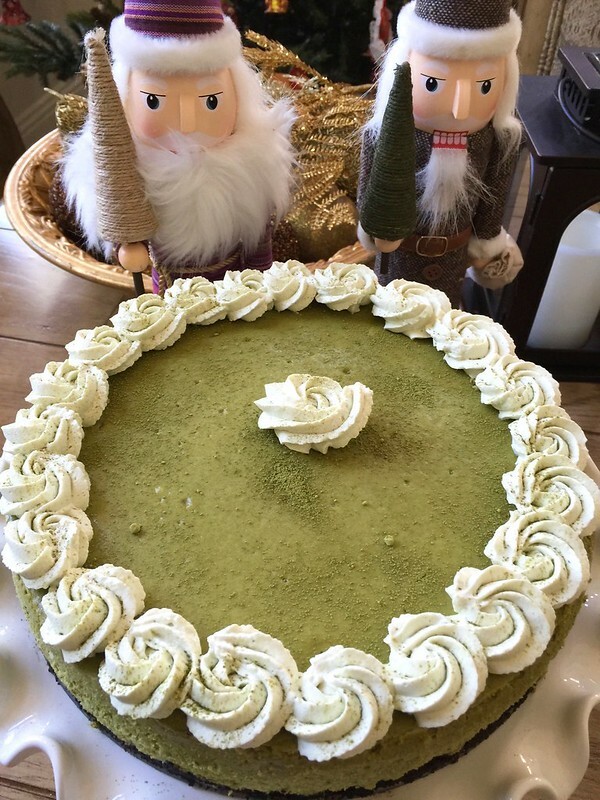 If you’d like the recipe for my Matcha Green Tea Cheesecake, click here. 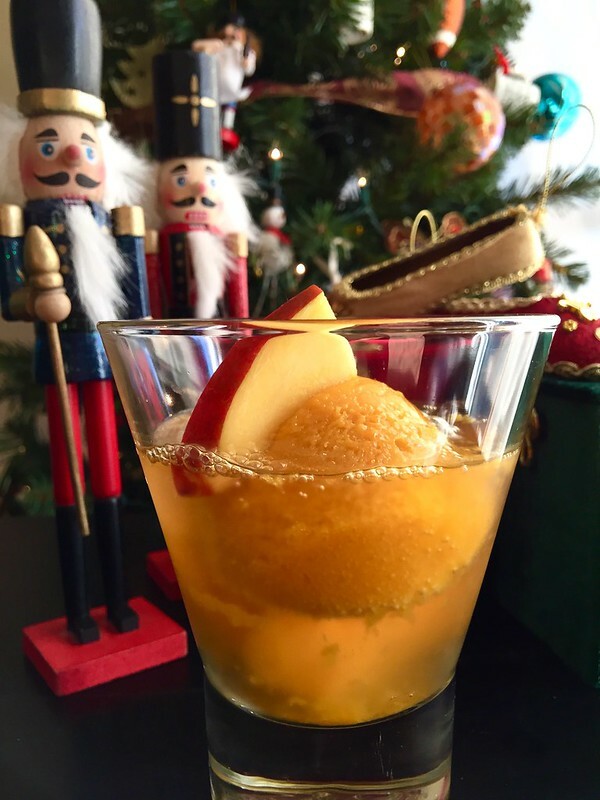 And if you need other delicious ideas for your holiday events, visit the recipe center at SafeEggs.com for cocktails, appetizers, entrees and desserts!